Christian perspectives on the observance of Halloween are strongly divided. Some debate over whether or not Christians should celebrate Halloween or even let their children celebrate Halloween. Some believers feel complete freedom to observe the holiday, others boycott or ignore it, a number celebrate it through more positive and imaginative observances and still others choose to take advantage of Halloween's evangelistic opportunities. In this article, I choose to tell the truth behind the myth that Halloween is a harmless children’s holiday and explain why no Christian should be involved in any shape, form or fashion with this, the darkest of all ‘commonly accepted’ holidays. Let’s get real about Halloween. First, let’s let the cat out of the bag right up front - Halloween or ‘All Hallows Eve’ as it is rightfully called, has strong roots in paganism and is closely connected with worship of the enemy of everything Holy, Satan. It is a holiday that generally glorifies the dark things of this world, rather than the light of Jesus Christ, The Truth. Halloween has pagan roots stemming from the ancient Celtic festival of Samhain. This ancient harvest festival of the Druids, members of the priestly class in Britain, Ireland, and France, ushered in the New Year, beginning on the evening of October 31, with the lighting of bonfires and the offering of sacrifices – including, in some instances, live, human sacrifices. As the Druids danced around the fires, they celebrated the ending of the summer season and the beginning of the season of darkness. It was believed that at this time of year the invisible "gates" between the natural world and the dark spirit world would open, allowing for free movement between the two worlds. The Druids willingly welcomed in the dark side. As northern Europe and the British Isles became Christianized, the Church saw that the pagan festivals lured Christians to compromise their faith. Consequently, during the 8th century in the diocese of Rome, Pope Gregory III moved All Saints Day to November 1, officially making October 31 "All Hallows Eve," some say as a way of claiming the celebration for Christians. The Church not only sought to give Christians an alternative, spiritually edifying holiday; but also to proclaim the supremacy of the gospel over pagan superstition. The church knew that there was no need to "placate" the spirits— that eternal life is offered to all who believe in the atonement of Jesus Christ, who shed his blood to reconcile us to God and bring us eternal life. Unfortunately, the pagan practices associated with the season persisted and have been mixed into modern celebrations of Halloween. Rather than fearing the "tricks" of those who have died, Christians reflected on the lives and deaths of those who were faithful and used them as role models for their own walks with the Lord; and thanked God for preserving the saints in the midst of suffering and persecution. In 1517, a monk named Martin Luther honored the faithful saints of the past by choosing All Saints Day (November 1) as the day to publicly charge the Church heirarchy with abandoning biblical faith. This became known as "Reformation Day," a fitting celebration of the restoration the same biblical faith held by the saints throughout church history. Today Halloween is almost exclusively an American secular holiday. Most people who celebrate Halloween have no conception of its religious origins or its heritage of paganism. Halloween didn't become an American holiday until the immigration of the working classes from the British Isles in the late nineteenth century. The mischievous aspects of the holiday attracted many American young people, who borrowed or adapted many customs without reference or care to their pagan, anti-Christ origins. Today, as society has become more and more relaxed in its approach to almost everything, we have also become desensitized to things that are unquestionably from the dark side. Satan is having a field day! We have become openly saturated with books, movies, TV shows and video games that, not only accept, but glorify topics of witchcraft, sorcery, evil spirits and even zombies. Instead of celebrating life, every single aspect of these things is a celebration of death and opens the door for demonization of all people, from children to adults. From the seemingly innocent Harry Potter to the never-ending stream of vampire and zombie movies and TV shows, we are openly and care-freely celebrating evil at every turn. Even Disney is cashing in on Satan with the most recent popular attraction at Disney World – Halloween Horror Nights! Have you noticed how costumes and masks are getting increasingly bloodier, gory, and depraved each year? More and more the enemy is infiltrating into the mainstream. Unfortunately, the gruesome, grotesque and the occult are increasingly glorified in all society, not just in America and not only on Halloween, but throughout the year. Keep it Simple -What Does the Bible Say? If you call yourself Christian then there are certain things that you MUST believe in. One of those things is that the Bible is the breathed word of God! Then, as Christians, and according to 1Peter 2:11 when it says “ Beloved, I urge you as aliens and strangers to abstain from fleshly lusts which wage war against the soul”, we are not of this world but, by having Jesus Christ alive in us, are supposed to be different. As it says in Roman 6:11, “ Even so consider yourselves to be dead to sin, but alive to God in Christ Jesus.” When we came to Christ we died to ourselves and became alive in Him! As Christians we are instructed not to be of this world. In Matthew 12:30 Jesus instructs us that we are “either for me or against me” There is no gray people – it’s either black or white, dark or light. The Kingdom of Heaven is not Burger King and you cannot have it your way! Even though there was no such thing as Halloween when the Bible was written, from these passages we can certainly draw the conclusion that we, as Christians, should NOT be involved with ANYTHING that glorifies darkness or Satan. Therefore, true followers of Christ believe that participating in Halloween is a form of worshiping evil and darkness. Deuteronomy 18:10-12 For example, never sacrifice your son or daughter as a burnt offering. And do not let your people practice fortune-telling or sorcery, or allow them to interpret omens, or engage in witchcraft, or cast spells, or function as mediums or psychics, or call forth the spirits of the dead. Anyone who does these things is an object of horror and disgust to the Lord. But you say, wait a minute, how many Christians are sacrificing their sons and daughters as a burnt offering on Halloween? How many are calling forth the spirits of the dead? Where does it say that "trick or treat" disgusts the Lord? Aren't we supposed to "become all things to all men so that by all possible means" as it says in 1 Corinthians 9:22? Well, what if, just supposing, you have come to the Christian faith from a background in the occult? What if, before you became a Christian, you did practice some of these deeds associated with witchcraft and sorcery – or are even drawn to such things in the natural? Then refraining from Halloween and its activities is the safest and most appropriate response for you as an individual – not to mention a Christian. Besides that, as Christians, we are directed to “not participate in the unfruitful deeds of darkness” and that should be enough for us…period. The custom of “trick-or-treating” actually originated, not with the Irish Celts, but with a ninth-century European custom called ‘souling’. On November 2nd, or ‘All Souls Day’, early Christians would walk from village-to-village begging for "soul cakes," made out of square pieces of bread with currants. The more soul cakes beggars would receive, the more prayers they would promise to say on behalf of the donors’ dead relatives. At the time, it was believed that the dead remained in limbo for a time after death, and that prayer, even by strangers, could expedite a soul's passage to heaven. Today, this idea is commonly referred to as “Purgatory” in a number of churches -- an idea which completely contradicts the Bible and Christianity. Where Did Jack-O-Lanterns Come From? The Jack-O-Lantern custom definitely originates from Irish folklore. As the tale is told, a man named Jack, who was notorious as a drunkard and trickster, tricked Satan into climbing a tree. Jack then carved an image of a cross in the tree's trunk, trapping the devil up the tree. Jack made a deal with the devil that, if he would never tempt him again, he would promise to let him down the tree. According to the folklore, after Jack’s death, he was denied entrance into Heaven because of his evil ways, but he was also denied access to Hell because he had tricked the devil. Instead, the devil gave him a single ember to light his way through the frigid darkness. The ember was placed inside a hollowed-out turnip to keep it glowing for a long period of time. The Irish originally used turnips as "Jack- O-Lanterns". But when Irish immigrants came to America, they found that pumpkins were far more plentiful than turnips. So the Jack-O-Lantern in America became a hollowed-out pumpkin, lit with an ember. 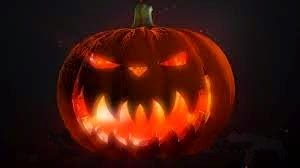 In the days of Irish History, it was believed that Jack- O-Lantern’s were placed outside of a person’s front door during Samhain to scare away evil spirits, such as Jack! A further confirmation that the entire concept of Halloween is that of loosing evil spirits! What Do Christians Today Think? According to a recent online poll, with 4700 responders, Christian participation in celebrating Halloween is split pretty evenly, with 38% saying they think it is harmless and 37% saying they think it is wrong for a Christian to celebrate Halloween. I know all this may be new for some of you but hopefully it has given you pause to reconsider your family's involvement in a pagan holiday. There are a lot of ‘Christian’ churches out there wrongfully pushing Halloween as a ‘harmless children’s holiday’, mainly out of ignorance to the historical, pagan background. We pray that some light has been shed on the subject of living a complete Christian lifestyle – no matter how unpopular it may be. Remember, in the end times, when the fire hits the feet - when we are going to either deny Christ or possibly die praising Him, standing with Him will be unpopular as well.